"Ole Edvard Antonsen, Norway´s trumpet god, played his instrument with such passion and heat that I´m surprised that neither of them melted!" "Right in the midst of it all stands Ole Edvard Antonsen, distinguished, unwavering and with an enormous lung capacity, letting the most complex melodic turns, rhythms and leaps flow effortlessly from his trumpet. It makes way for the soaringingly beautiful and brutal, the velvet and gravel ..."
Aftenposten Feb 8, 2013, MacMillan "Epiclesis" with Oslo Philharmonic Orchestra. "Sein Spiel berührt direkt das Herz." "And Antonsen plays with his rare smooth tone of intricate passages and lyrical lines side by side, rhythmically subtle and solid." 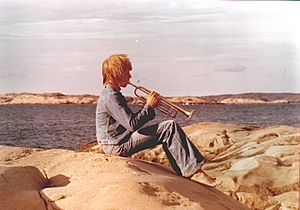 VG , May 3, 2013, review of the CD "French Trumpet Concertos"
"Many have pointed out that listening to Ole Edvard Antonsen's music is like seeing the pictures to the film not yet produced"
Ole Edvard Antonsen's latest album is now released. Described as being 'more than a virtuoso: a phenomenal artist' in the French magazine Diapason, Ole Edvard Antonsen here receives expert support from the São Paulo Symphony Orchestra, praised worldwide for colourful performances. Great reviews for "French Trumpet Concertos". The first reviews of the new CD "French Trumpet Concertos" is out. Norways largest newspaper, VG (Verdens Gang) gives the album a 5 (out of 6). Ole Edvard received a gold trophy for more than 15.000 sold of the album "Landscapes" . TREMENDOUS SUCCESS for Ole Edvard Antonsen with the London Symphony Orchestra at London's Barbican! A photo gallery with memories from a long career.